One of the challenges we face in the fire service is the consequences of new building construction throughout the United States. Much of this new construction has incorporated lightweight building assemblies into the design and overall strength of the structure. Unfortunately, many fire departments have little experience combating fires in these houses of cards. This new boom in building construction has also brought about an upsurge in structures that include standpipe systems as a means of water supply for firefighting purposes. Standpipe systems have been required, by building and fire codes, either because of the height or overall size of the structure. Many fire departments have limited experience operating handlines off these systems. Furthermore, most fire departments that have standpipe systems within their jurisdiction may have little or no opportunity to train with them. Ultimately, the knowledge and understanding of the function and limitations of these standpipe systems are lacking in the fire service. While instructing at the Fire Department Instructors Conference in Indianapolis, Indiana, we were astonished to learn that the vast majority of fire departments are unfortunately relying solely on 13/4-inch attack lines and combination fog nozzles-in some cases, automatic nozzles-for their high-rise and standpipe operations. This comes as a shock to us, especially in light of the tragic One Meridian Plaza Fire (Philadelphia, February 1991). This fire, which claimed the lives of three firefighters, provided the fire service with many valuable lessons, which we must not ignore! Although the 13/4-inch handline is a very valuable tool for the vast majority of fires that most fire departments encounter, it can be a dangerous and deadly choice for high-rise and standpipe operations. Coupled with a combination fog nozzle, especially those of the automatic variety, fire departments could be setting themselves up for failure and a potential tragedy not unlike the One Meridian Plaza Fire. The 13/4-inch and fog nozzle combination should be considered a higher-pressure, lower-volume weapon. Although many in the fire service speak about the theoretical flow of well over 200 gpm from this hose nozzle combination, the reality is much different. First, the pressures needed to achieve such high flows are not only dangerous to achieve but also downright impossible when operating from a typical low-pressure standpipe system. Furthermore, even if these high pressures could be achieved, the maneuverability benefit typically associated with the 13/4-inch line will be lost. The ideal choice of equipment needs to be a combination of hose that can deliver increased gallons with low friction loss and a nozzle that will operate at low pressures and not reduce the flow. How can we achieve these higher flows at lower pressures? The answer is simple and, for most fire departments, relatively easy to achieve with their current inventory of tools. Fire departments must equip themselves with a low-pressure, high-volume hose and nozzles for standpipe operations. Without spending years doing research and development, fire departments need not look far to discover a simple, cost-effective solution to this problem. The answer rests with two very basic yet effective tools that have unfortunately been retired by many fire departments. These tools are the 21/2-inch handline and the smooth bore/solid stream nozzle. There are many firefighters, company officers, and chief officers who are staunch supporters and proponents of the 13/4-inch fog nozzle combination. If you are one of them, you might be inclined to stop reading right here. Please don’t! We wish to prove our point with facts because we believe that many well-intentioned fire service professionals have been operating on fiction-one fiction being the efficiency and gallons of flow, or lack thereof, which many think they are attaining at standpipe fire operations! We in the fire service have in the past blamed the volume and intensity of fires as to the reason why we “could not make the push into the fire area.” “The hose streams seemed to have no effect” is another answer we hear all too often. But perhaps the poor choice of tools used to combat these fires was at the root of the problem. Why would we equip our firefighters with weak and ineffective equipment that places them in extreme danger should conditions change drastically on the fireground? Firefighting in buildings equipped with standpipes can be extremely difficult, and there are many conditions and consequences that cannot be controlled during fire operations. Generally we are compelled to approach and attack the fire from a stairwell. But most commonly, standpipe-equipped structures will only have two stairwells for access and egress. This limits our strategies to use only one stairwell for attack and one for evacuation. When both stairwells are used as attack stairs, they both become contaminated with smoke, making it difficult to access the upper floors without going “on air” and also difficult to remove any trapped occupants from above the fire. Furthermore, the preburn time of a fire can cause windows to fail in the fire area before we are able to apply water to the fire source. This can create blowtorch-type conditions in the fire area. Attacking fire conditions of this magnitude with a 13/4-inch line and fog nozzle combination would be the equivalent of attempting to extinguish a large fire with a garden hose. We should critique our past operations that have not been successful and admit our mistakes or poor judgment. One of the most common arguments against the use of 21/2-inch hose with smooth bore/solid stream tips is, “We don’t have the staffing to stretch, advance, and operate this heavy and cumbersome equipment.” However, we know that it can be done. 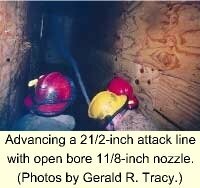 Yes, you can operate and advance a 21/2-inch attack line, even with minimal staffing. And yes, a smooth bore/solid stream nozzle will provide that ever-important “protection” for firefighters, even if you were unfortunate enough to be trained behind that false sense of security referred to as a wide fog pattern. If you want to know how to achieve success with these tools, it’s in the training-that’s right, that critical, yet often missing component of the modern fire service: fire training! Low-pressure standpipe systems are simply a fact of life. Most of the older fire codes throughout the United States required standpipe systems to provide only 65 psi at the topmost standpipe outlet with 500 gpm flowing. Countless high-rise and standpipe-equipped buildings across the nation were built under this 65-psi requirement. Newer codes require 100 psi, as recommended by the NFPA, but that still might not be enough pressure to supply handlines adequately for many standpipe operations. Because of these low pressure requirements, fire departments may encounter situations in which there might not be enough pressure to compensate for the high friction loss in 13/4-inch handlines as well as the required 100-psi nozzle pressure typically associated with most combination fog nozzles. Also keep in mind that these minimum fire code requirements are based on an ideal situation, in which the standpipe has been properly maintained and is 100 percent dependable-a scenario that we all must realize does not exist in most of our buildings! In addition, the piping of many standpipe systems is rated for a working pressure of 175 psi; if you introduce pressures higher than this, you risk overpressurizing the system. Even if the standpipe system is designed, maintained, and operating properly, there is also the issue of pressure-regulating devices, including pressure-regulating valves (PRVs). One of the worst tragedies in the history of the American fire service involved improperly set PRVs. The One Meridian Plaza Fire should forever serve as a graphic example to all fire departments that respond to and protect high-rise and standpipe-equipped buildings that low standpipe operating pressure is an indisputable and real problem! Although we hope to touch many in the fire service with this information, we are not necessarily the first pioneers to discover this information. In fact, understand that numerous fire service professionals have studied this particular issue for the past several years, especially since the One Meridian Plaza Fire. For example, because of that fire, the National Fire Protection Association sent out an Alert Bulletin specifically addressing PRVs. In that Alert Bulletin (#91-3, May 1991), information from NFPA 14, Standard for the Installation of Standpipe, Private Hydrant, and Hose Systems, was reiterated. The following is a very important excerpt from NFPA 14. Note: For high-rise standpipe operations, we recommend that fire departments hook up to a hose outlet on the floor below the fire floor. Therefore, an additional 5 psi (total 70 psi) is required to attain 50 psi at the nozzle. There is approximately 15 psi of friction loss per 100 feet of 21/2-inch handline flowing 250 gpm. NFPA 14 is not new to the American fire service. This valuable information has been around for quite some time. However, it has apparently either been forgotten or not reviewed by some fire departments prior to the implementation of their standpipe equipment. In his book Fire Stream Management Handbook (Fire Engineering, 1991), David P. Fornell provides photographs, figures, and illustrations (on page 192) from his research regarding the low-pressure performance of different nozzle styles. Once again, the recommendation comes down to smooth bore/solid stream nozzles and larger-diameter attack handline, specifically 21/2-inch hose for high-rise and standpipe operations. Debris, rust, scale, and sediment within the standpipe system are just more facts of life for those fire departments with high-rise and standpipe-equipped buildings. Captain Thor Hansen of the Denver Fire Department (DFD) Fire Prevention Bureau, High Rise Section, recently acquired a section of pipe that was removed from the standpipe system of a Denver high-rise building. This section of pipe, which was the male end threaded directly to a standpipe outlet, was almost completely obstructed with debris, rust, and scale. The debris in this standpipe system was only discovered because of Hansen’s professional and tenacious efforts. How many high-rise or standpipe-equipped buildings in your jurisdiction might have pipes with similar obstructions? In large cities, it would be virtually impossible to identify all of the problem buildings and standpipe systems. Therefore, we must be prepared for such problems by utilizing the correct tools and selecting the proper equipment for firefighting. “Simple, inexpensive, lightweight, and very durable” describes a very good debris-passing tool, the smooth bore/solid stream nozzle. Yes, this nozzle can also become clogged up with some debris, but not nearly as easily as a combination fog nozzle can. Perform the M & MT Test on your nozzles: Simply pour a large package of Peanut M & MsT into the inlet side of a combination fog nozzle, as well as the inlet side of a smooth bore/solid stream nozzle. Attach hoselines, charge them with water, and test the performance. You’ll see! There will be no repairs needed on your smooth bore/solid stream nozzle, as the debris is quickly shot out into space. However, even the flush setting on the combination fog nozzle will not allow the passage of small M & Ms. Furthermore, the fog nozzle might become clogged to the extent that repairs and some “TLC” will be needed. Just when we think we’re making progress, some of our readers might find themselves still stuck on the nozzle issue. After all, many members of the fire service were specifically trained to utilize fog for “protection,” right? However, once again, the forward thinking and progressive fire service professional has a lot of specific information available to clear up that issue. Andy Fredericks’ two-part article “Little Drops of Water: 50 Years Later” (Fire Engineering, February and March 2000) is just one example of the information that all progressive thinkers must review. David P. Fornell addresses the nozzle issue extensively in his book as well. In the modern 21st century fire service, David P. Fornell has referred to the inappropriate application of water fog as the “bastardization of Lloyd Layman’s theories.” Both Fredericks and Fornell thoroughly explain what Layman meant by an indirect attack and what its specific requirements were: extreme high heat; limited or no ventilation; and no occupants (firefighters operating in offensive mode are occupants!). So how do you protect yourself and your crew? Simple-put out the fire! Don’t use the limited reach of a wide fog to place you and your attack team in a much more dangerous position. Don’t push fire into uninvolved areas, toward trapped occupants (customers), or even on top of fellow firefighters. Don’t create steam and make the poor visibility even worse by the inappropriate application of water fog. Do use the low-pressure, high-volume reach and penetration of a smooth bore/solid stream nozzle to attack and control the fire, complete proactive precontrol hydraulic overhaul, and stop the fire! And, of course, if your fire is small and incipient, you don’t have to drill it with a full flow. Simply open the bail slightly and apply whatever amount of water you need. We are encouraging firefighters to take a big gun with them. You won’t always need all of the bullets, but when you do, you’ll be glad you have them. One last word regarding nozzles: We are not encouraging fire departments to eliminate combination fog nozzles from their inventory. Fog nozzles are a very valuable but frequently misused fire service tool and should definitely not be used off standpipe systems. Proper handline selection completes the overall weapon for the fire attack. The primary advantage of the 13/4-inch handline is obvious: It is a smaller, more maneuverable handline. Keep using this valuable tool when it is appropriate, but don’t ever expect to achieve the same flows that you would have with a 21/2-inch handline. The disadvantages of the 13/4-inch handline are high friction and the fact that when this hose develops a kink, the loss in flow can be devastating. It is critical to remember that the friction loss in the 13/4-inch handline is at least six times that of a 21/2-inch at equal flows. Therefore, keeping in mind that one of the primary problems associated with standpipe operations is the low pressure, we won’t have a lot of pressure to spare dealing with high friction loss. Let’s face it, the 21/2-inch handline is and always will be a more physically challenging weapon. In fact, the size, weight, and maneuverability issues are frequently what keep a fire officer from selecting this size hose in the first place, even when that officer knows that it would be a more appropriate selection. Many firefighters and fire officers may have had, at one time or another, an unfavorable experience using the 21/2-inch handline. Because of that, they will likely base all of their future hoseline selection decisions on what we believe are the “correctable” problems (such as overpressurization) that frequently plague many 21/2-inch handline operations. We believe there are five specific “keys to success” when operating with the 21/2-inch handline. With these key components in place, this operation is no longer an intimidating and formidable opponent. User-friendly high-rise/standpipe hose packs. The hose pack should be as lightweight and compact as possible, relatively easy and comfortable to carry, and easy to quickly stretch and advance. Note: A one-piece high-rise/standpipe hose pack is very impractical based on both the size and overall weight. The DFD and FDNY utilize three separate 50-foot 21/2-inch hose packs, each carried by one firefighter. The adapters, appliances, and related standpipe tools are carried in a separate equipment bag. This division of labor reduces the overall reflex time, especially when stairs have to be utilized to get to the upper floors of a high-rise or standpipe-equipped building. On arrival at the floor below the fire, members stretch and connect the hose at this location. Low-pressure, smooth bore/solid stream nozzles. The next critical component is the proper nozzle. It seems that much of the American fire service is stuck in a “fog nozzle mind-set.” The fog nozzle is a very valuable tool for certain applications, and the well-equipped engine company should certainly have a complement of fog nozzles on board. However, that same engine company should be equipped with several smooth bore nozzles as well, especially for high-rise/standpipe operations. It all boils down to something we call nozzle reaction-the force pushing against us as we attempt to operate and advance a handline. Nozzle reaction is a function of the weight of the water being delivered (gpm) and the nozzle pressure. Most fog nozzles, with the exception of some new low-pressure models, are designed to operate at 100 psi. The smooth bore nozzle operates at 50 psi. To reduce the nozzle reaction, you have two choices: reduce the flow or reduce the nozzle pressure. Reducing the flow is not a good choice if you want to stop the fire and stop it NOW! Reducing the nozzle pressure is a good choice and an easy one at that. Simply choose the proper nozzle and, in this case, the obvious choice for use with a 21/2-inch handline is a smooth bore/solid stream nozzle. Capable of delivering its rated flow at 50 psi nozzle pressure, this nozzle, along with the 21/2-inch handline, is the best choice for low-pressure, high-volume flow. Proper operating pressures. Just because a 21/2-inch line is larger does not mean more psi! Proper pump pressures for most 21/2-inch hose layouts are relatively low, frequently much less than 100 psi, because of the significantly lower friction loss in the 21/2-inch line and low nozzle pressure (when using the appropriate nozzle). Train your pump operators thoroughly, and specifically train them not to overpressurize the system. Ultimately, if the attack line is overpressurized, it will likely be a bad experience for those at the nozzle, and they won’t want to try it again! The use of a standpipe in-line pressure gauge (standard equipment used by both the DFD and FDNY for standpipe operations) facilitates proper operating pressures by providing a method to read the standpipe pressure at the outlet. A firefighter assigned to the outlet can then make adjustments by opening or closing the outlet valve as necessary. Proper stretching and advancing. The operations of a proficient engine company can mean the difference between lives saved and lives lost. It can also be the difference between buildings saved and parking lots created. A user-friendly high-rise/standpipe hose pack will significantly help the engine company crew with stretching the attack line; however, it all starts and ends with the basics. Properly stretching the 2 1/2 inch line before charging it will pay countless dividends during the attack. For example, one small pile of hose left unchecked equates to several kinks in the charged hoseline. This makes advancement very difficult and leads to reduced water delivery. Some individuals advocate correcting kinks by adding pressure, a very dangerous practice. Take the time necessary to stretch the line properly the first time. When the attack must begin immediately after exiting the stairwell, we recommend stretching the lead length of hose out and up one flight of stairs above the fire floor landing before charging the hose. When this line is charged with water, the weight of the hose and gravity will assist in the advancement of the first 50 feet of line out onto the fire floor. If the fire is confined (contained behind firewalls and/or fire-rated door) on the fire floor, allowing the line to be safely stretched up to that area before being charged, then do so. Ensure that a working length of hose is available outside the fire area once the line is charged. You must have enough hose to advance into the fire area without having to haul a charged hoseline up a stairwell. Use the floor to counter nozzle reaction. The backup firefighter can press the line down against the floor with his body weight, allowing the nozzle firefighter to direct the stream. For advancing, the backup firefighter must pick up the hose and pull it forward, all the while working to counter the nozzle reaction. If necessary, use “hit-and-move” tactics (shutting down the nozzle or partially closing the nozzle when moving) to make movement of the line easier. The third firefighter has the most difficult job of pulling additional hose as necessary. Once again, on the ground or floor, this firefighter can use the strength of his legs pressed against a doorjamb, for example, to provide a firm anchor as he pulls the hoseline in a fashion similar to that of a rowing machine. You might be surprised how effective three mentally prepared and physically fit firefighters can be with a 21/2-inch handline. Don’t hesitate to have two separate engine companies operate one handline. In many cases, this provides four, six, or perhaps even more firefighters (depending on a department’s staffing levels) to operate and advance the handline. The extra hands speed up the operation, especially when making turns with the line inside a building. Training, training, and more training. Often training is considered a dirty word in the fire service. However, the truly dedicated firefighter and fire officer fully understand that preparation is the key to success and firefighter safety. Take the time to conduct realistic and productive training drills with your 21/2-inch handline. Not once a year or even monthly but perhaps weekly in the beginning. The training we are referring to is not on the front ramp of the fire station, in gym shorts and T-shirts, and in a standing position. Use your department’s burn building or drill tower. If you don’t have these resources, be creative. Use a playground to simulate obstructions typically found in a building. Perhaps you could use an abandoned building or a structure scheduled for demolition. You can even stretch hose into and through your own fire station if necessary. Ideally, try to gain access to a high-rise or standpipe-equipped building for your drills. A multistory parking garage is ideal. Also, try to get permission to charge and flow water from the lines if there is an appropriate location to discharge the water-i.e., windows, roof, floor drains. Most importantly, conduct these training drills in full personal protective equipment (PPE), including SCBA-not only for the immediate firefighter safety purposes but to create a realistic scenario as well. Don your face piece and go “on air” just as you would in a real fire. Get down low, operate on the ground or floor, and make your training as realistic as possible. If you can include a live burn with your training, all the better. Reflex time is the total amount of time it will take for the attack team to complete the following: respond to and gain access into the building; transport all of the necessary tools and equipment up to the staging area; proceed to the floor below for hookup to the standpipe; stretch a handline off the standpipe; and get water on the fire. A number of factors can contribute to a reduction in reflex time. First, having a well-trained, mentally prepared, and physically fit team of firefighters. Second, having the critically important equipment components-specifically, low-pressure, high-volume hose and nozzles. Remember, the fire that may appear to be easily controlled with a 13/4-inch handline as you look up from the street is doubling in size every half-minute. Therefore, it will likely be a much larger fire once you get up to it-that is, after the collective reflex time needed by the attack team to finally get water on the fire. Ultimately, choose your handlines, nozzles, and equipment (weapons) wisely and with a significant reflex time in mind. Most standpipe systems are low-pressure water delivery systems with a vast array of potential problems and possible failures. Our own history provides us with specific and tragic examples, including the supreme sacrifice made by many of our fellow firefighters. The equipment solutions described in this article are nothing new, but those fire service individuals who call themselves forward and progressive thinkers must remember that sometimes the best ideas come from our past. We encourage each of you to serve as true ambassadors of proper high-rise/standpipe operations: Go out and equip your fire department with the appropriate equipment, and conduct the necessary training to safely and successfully combat your next high-rise/standpipe fire.